It can also be, at many gatherings, a time to fight. Blame it on equal parts of putting families together in tight quarters with too much food and too many long-held feuds that somehow always seem to bubble up at this time of the year. Tack on politics and, well… let’s just say it will be much easier to bite into Aunt Sadie’s sweet potato casserole than it will be to bite your tongue. 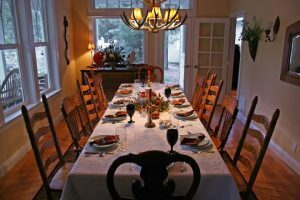 Beyond politics, many people have strong opinions about what dishes to serve, whether the turkey should be broiled, deep-fried or made of tofu and who is going to do the dishes. So why fight the fight? A report in The New York Times says this may be a good time to explore what psychologists and philosophers say are the most effective ways to argue. And by “argue” they do not mean “quarrel,” but rather communicating to someone’s opposing viewpoint without rancor or faulty reasoning, with the hope of broadening one’s understanding of your own viewpoints ideas. “The aim of an argument should not be proving who is right, but conveying that you care about the issues,” said Amy J. C. Cuddy, a social psychologist and associate professor at Harvard University. Show compasion towards the view of the person with. Some people start an argument by simply dropping their position on a subject and refusing to budge, something that Dr. Cuddy called “dropping the anchor.” Instead, try to reach out and understand the other person’s point of view; it does not mean you have to agree with them, or that you are abandoning deeply felt objections to, for example, racism or sexism, she said. We conciously and subconciously use body language to convey what we mean without using words. Sometimes that body language can send messages that are more compelling than the words coming out of your mouth. Don’t think of an argument as an opportunity to convince. Rather, think of it as a way to test and improve your opinions on top of gaining a better understanding of the other side. A good argument is supported by evidence, and new evidence brought into play may have more of an effect than just opinionated words.